Cycling's New Leader Promises New Era; Will Seek Armstrong's Input : The Two-Way Britain's Brian Cookson says he will focus on helping cycling recover from years of doping scandals. "I felt I owed it to the cycling world to put an end to the misery that we were all going through," he says. 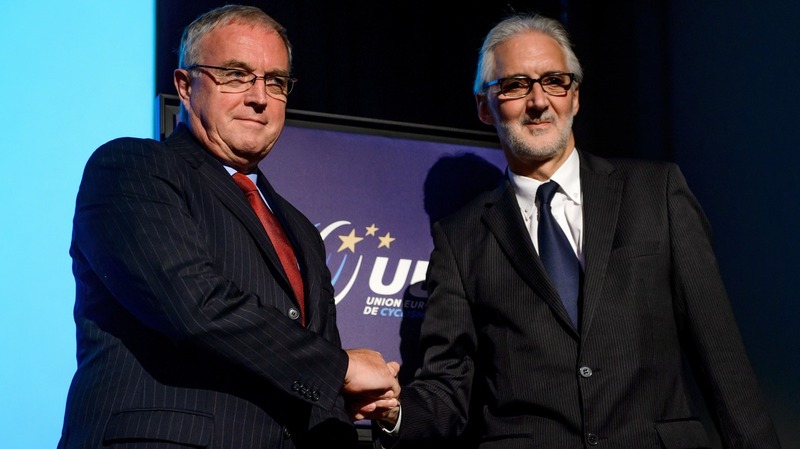 The incoming president of the International Cycling Union, Brian Cookson (right), shakes hands earlier this month with Pat McQuaid, the incumbent he defeated. The International Cycling Union (UCI) has chosen a new leader. Britain's Brian Cookson beat incumbent Pat McQuaid in a contentious vote held in Italy Friday. Cookson, who led British Cycling to new heights, says he will focus on improving cycling's reputation, tarnished by years of doping scandals. "I wasn't confident at all [of winning], but I felt I owed it to the cycling world to put an end to the misery that we were all going through," Cookson tells VeloNews. "I think people respected that." "McQuaid became UCI president in 2005 and was credited with improving anti-doping efforts in the sport. But critics claimed McQuaid and his predecessor, Hein Verbruggen, covered up doping, particularly with their cash cow, Armstrong. McQuaid and Verbruggen always denied the allegations. "Cookson won Friday's vote 24-18. His priorities include making anti-doping procedures in cycling fully independent." And Cookson says he wants Armstrong to be part of the process of bringing a new era to cycling, in part by taking a complete and honest look at a culture of doping, something critics say the UCI has never done. "We need to have a structure in place as quickly as possible," Cookson tells The Associated Press. "Lance Armstrong is obviously one of those people who will be invited to contribute to the process once we've established that, and I'll certainly be seeking to do that as quickly as possible." As for Armstrong's tweet, Cookson said, "Well I'm always pleased to hear that anyone is happy about my being elected, whoever it may be, Lance Armstrong or any other cycling fan around the world." Friday's vote came after support for McQuaid deteriorated and calls for a new era in cycling grew more fervent. In the early phases of the election process, McQuaid's candidacy was put forth by two national cycling entities — Ireland and Switzerland — that went on to withdraw their support. That was one factor that led to confusion over whether McQuaid had a legitimate standing to run for a new term. Eventually, Cookson insisted that all sides stop bickering over the issue and simply hold a vote.